Omega’s proprietary web-based reporting system provides all of the data that older historical static reporting systems provide, but in a customizable web-based tool that gives users greater control of how they view their data. Omegalytics offers significant enhancements over other best-in-class systems including traveler tracking, carbon footprint tracking, benchmarking, and most importantly, predictive analytics. The Executive Summary Dashboard gives users the ability to drill down into air, hotel, car and rail, making it all the way down to the traveler level data within a few clicks. Online adoption data is measured throughout all travel categories as well. It offers trend analysis at every level by choosing the desired timeframe (year, quarter, month, week) to compare travel data year over year. Each compartment of the dashboard data can be exported and sent via email directly from the dashboard interface within seconds. The Benchmarking Analysis Dashboard gives users the ability to benchmark their travel data against other companies, including Omega clientele and other travel management companies, by using data sourced from Airlines Reporting Corporation. 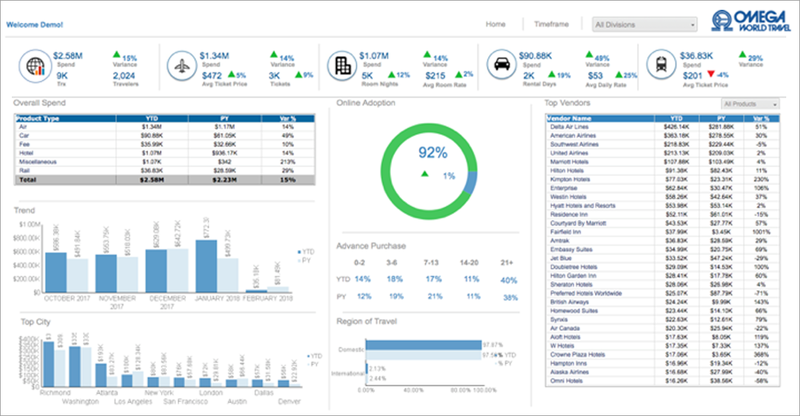 The What-If Scenarios Dashboard uses forward-forecasting to offer insight into the potential savings that can be achieved by altering vendor usage and traveler behavior, giving our clients real data to make immediately valuable decisions. 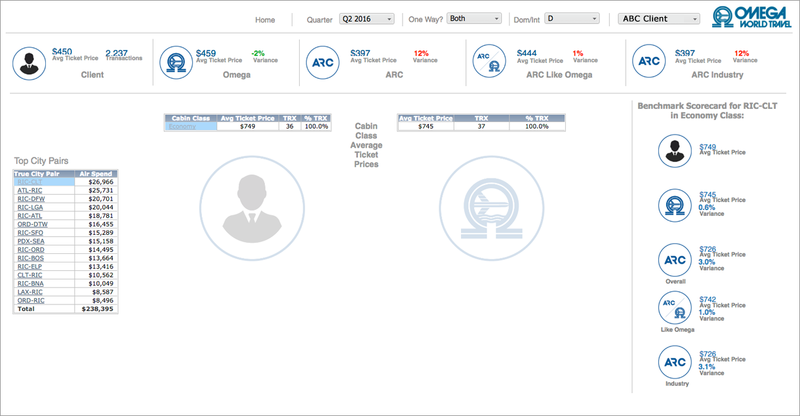 The Traveler Tracking Dashboard shows users a snapshot view of travelers world-wide. It offers the ability to drill down to see specific traveler information. An easy-to-use search function allows users to search by traveler name, country, city, vendor, flight number, and more. The Carbon Footprint Tracking Dashboard offers reporting, scoring, and analysis as part of a current and sound business model for our clients. 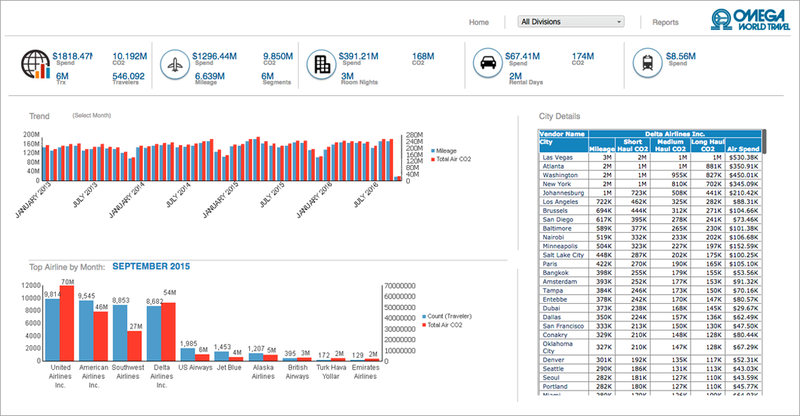 This dashboard breaks down your footprint by product category, including air, hotel, car and rail.